Original Post Office Green Papers. In the 1930s the General Post Office hosted lectures on various new or innovative aspects of its business, from engineering to public relations. The Green Papers were published versions of these lectures, and they have become an invaluable resource for information about the postal past. 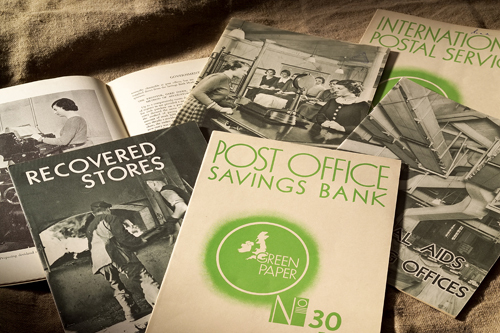 These are the original copies of the Green Papers from the 1930s, 40s and 50s – so numbers are strictly limited. Was £5.00 – NOW £3.00 each – or get 5 copies for the price of 4! Enter GR33N544 discount code at the online shop checkout when ordering 5 copies of more to receive the discount. 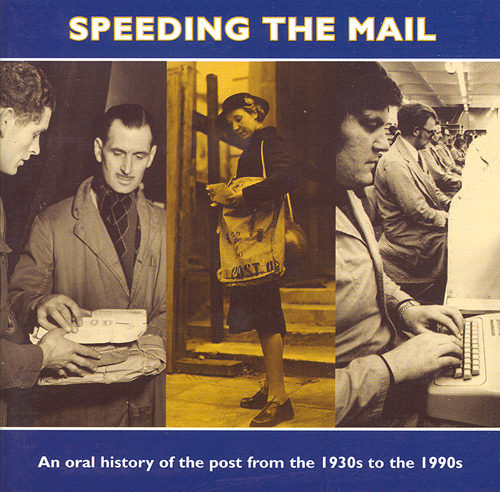 Speeding the Mail – An Oral History of the Post Office from the 1930s to 1990s Audio CD. Covering 60 years of postal history, this superb audio CD provides a fascinating glimpse behind the scenes to see how the job was done. Postal workers past and present talk about the way they used to work – recollections from the days of the GPO; stories by those who delivered letters, packets, parcels and even pairs of rabbits; stamp designers and those postal workers serving the public behind the Post Office counter. 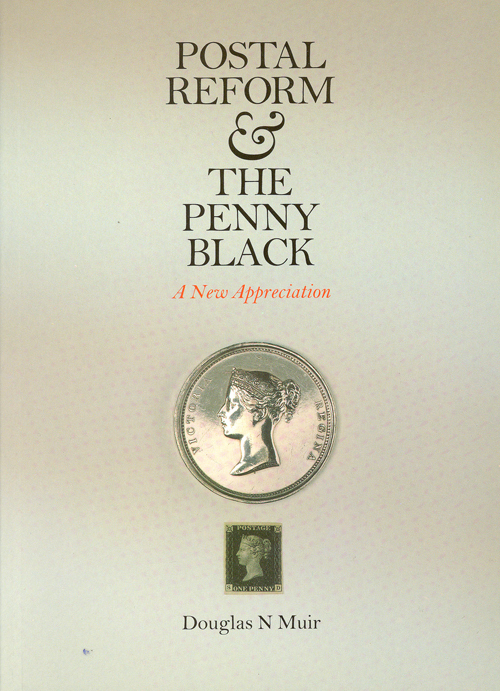 Postal Reform & the Penny Black – A New Appreciation. Douglas N. Muir, BPMA Curator (Philately), describes the long campaign for postal reform in this important study. He illustrates his account of the period leading to the issues of the Penny Black and the Mulready Covers with a wealth of contemporary designs, proofs and other philatelic material. Night Mail T-Shirt. 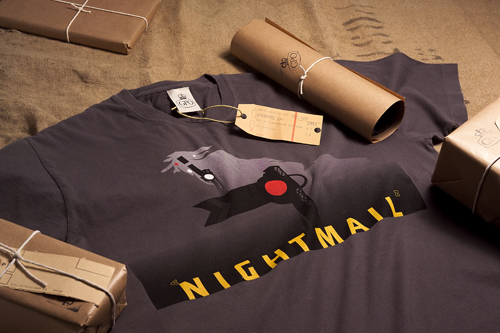 The striking poster design of the GPO Film Unit classic Night Mail (1936) has been adapted for these shirts. Like the film itself – a classic work. You can find all these products and more in our online shop www.postalheritage.org.uk/sale. And finally, a little reminder that Christmas is approaching fast – so ‘Post Early’ and order your Christmas cards soon from the BPMA Shop: www.postalheritage.org.uk/greetings. century there was a growing need for ‘kiosks’ in which to house them. ‘Public call offices’ were authorised by the Postmaster General in 1884. There were a number of suppliers and designs varied. Indoor versions had flat roofs while those outside were usually given pitched roofs, the better to withstand the weather. The wooden kiosks did not stand up to the elements well and it is not surprising that once most responsibility for the telephone network passed to the Post Office in 1912, cast iron and the occasional flirtation with concrete were the preferred materials for manufacturing telephone kiosks. Few wooden ‘silence cabinets’ survive today and if encountered it is normally the indoor variant that has had a more sheltered existence. 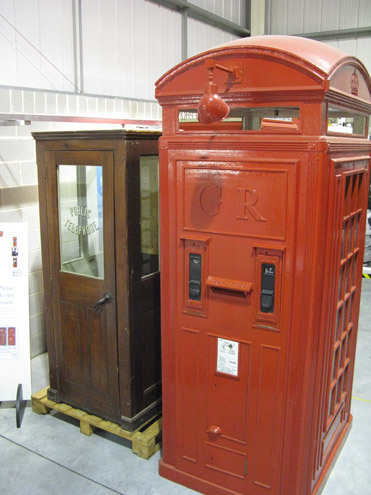 The BPMA hold four cast iron telephone kiosks from the period when the majority of the telephone systems fell under the auspices of the Post Office, these are the K2, K4, K6 and K8. One of the BPMA’s most recent acquisitions is a ‘Silence Cabinet’. This rare survivor from between the wars was in use until quite recently in a hotel in North Norfolk. kiosk being acquired by the BPMA, much survives in original condition. The panelled dark wood and cream coloured interior is typical of this style of kiosk. Arrival of the Silence Cabinet. The new acquisition was carefully lowered onto a new pallet so that it could be easily moved by museum curators. 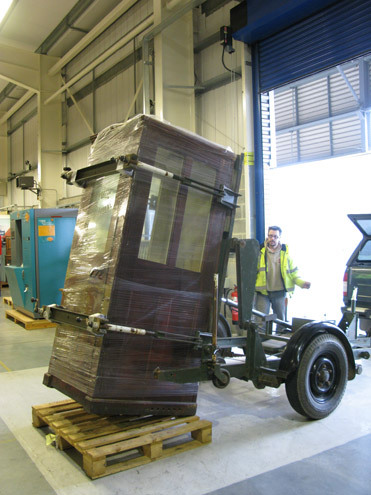 We were pleased to see the delivery occurring via one of the rare surviving kiosk trailers originally used by Post Office Telephones, sadly, not part of the BPMA collection! Most were installed in high status shops, railway stations, hotels and some post offices. Crown glass is for the most part double glazed for privacy and the legend ‘PUBLIC TELEPHONE’ on the glass in the door would have announced its purpose to any passer by. A special handle pulls the door tightly closed when shut, compressing the rubberised seal round the edge. Faint marks on the rear of the kiosk suggest that the kiosk may have been supplied by Siemens in 1923. The Silence Cabinet joins the other kiosks in the Museum Store. Now dwarfed by its larger cousin, the K4, or Vermillion Giant. BPMA also visited Le Strange Arms Hotel at Old Hunstanton where Robert Wyllie, the hotel manager, was interviewed for the BPMA Oral History collection. Consequently now hold a rarely obtained complementary history from someone who knew the object well. For this project, the BPMA worked with Royal Mail staff that had migrated to London, in particular with members of the Sikh, Hindu and Muslim Associations in Mount Pleasant Mail Centre. The reason for this choice was the wide diversity that exists within Mount Pleasant Mail Centre, only 34% of workers are White British and many different cultural and religious groups are active within the 24-hour workplace. The other two museums involved were Brent Museum who worked with Polish and Brazilian local communities, and Cuming Museum who worked with Gypsy Roma Travellers in the area. BPMA staff attended four religious festivals organised by these associations in Mount Pleasant (Diwali, Guru Nanak’s Birthday, Vaisakhi and Eid) to collect oral recordings, photographs and objects. The next stage of the project was to use this material to create an online exhibition with help from participants from these groups, giving information on the associations, the festivals they celebrate and the stories of the people within these associations. A facilitator experienced in working with community groups was appointed on a freelance basis to lead sessions with members of the associations to create this web exhibition. Eight sessions were held in Mount Pleasant Learning Centre with fourteen volunteers from the associations, and much of the text and images in the exhibition was created and uploaded by these people. Many of the participants gained new computer skills from being involved in these sessions. Audio clips from interviews with members of the associations have also been added to the web exhibition and there is also the chance for other staff to add their own stories of migrating to London and working for Royal Mail. This project has been a great opportunity for the BPMA to diversify its collections by collecting material reflecting groups not previously represented. The collection now better represents the diversity of Mount Pleasant and the different religious groups that exist within it. It has also given us the opportunity to build up stronger relationships with staff in Mount Pleasant that are sustainable into the future and to form new partnerships with other museums. The exhibition can be viewed on our website so please have a look at all the hard work done by members of these associations or add your own stories of migrating to London or working for Royal Mail. What does the Post Office mean to you? What does the Post Office mean to you? An interesting question and probably not one that we often consider. Is it the loss of our favourite local post office, or is it the continued success of this everyday resource with a friendly face behind the counter, where a single stamp is provided with the same enthusiasm as a bulk dispatch of eBay packages? What do you think of when a holiday postcard is dropped onto your doormat? It is unlikely that any of us spare a thought to the process that bought it from a resort to our house for the modest cost of a stamp. It is also unlikely that we view with such warmth the steady stream of monthly bills or ‘junk’ mail that invades our homes on a far too regular basis! An oral history drop-in session in progress. Many of us have spent a few weeks, possibly as a student, working as a ‘casual’ over the busy Christmas period. Or possibly you may have completed ten, twenty, thirty, even forty years service for the Post Office, Royal Mail, Parcelforce or Romec. These days, with a changing mails market, increasing numbers of people are actually employed by competitors within the mail business; employed by TNT, DHL, Business Post, City Link or one of the many others vying for space. How do you feel about these changes in the home mail market? If you have an opinion on any of the above or other associated matters, The British Postal Museum & Archive are interested in your views. We will be hosting two ‘drop-in’ sessions in 2009 where the one big question will be asked: “What does the Post Office mean to you?” Speaking to one of the BPMA curators, we are offering the opportunity for anyone to have their view recorded, be it a three minute rant or a longer discourse on a fondly remembered service. It is the BPMA’s aim to capture a snap-shot of people’s views and opinions during the most radical shake-up of the domestic mail market seen in over 150 years.